Go green with your holiday shopping this year! Join us for our FREE green craft fair this Saturday, November 10 from 10am-4pm at Watkins Nature Center, located in Watkins Regional Park. Explore environmentally-friendly, hand-crafted products from local artists. 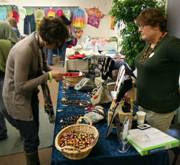 Items for sale include jewelry, wood carvings, knitwear, gardening décor, and much more. · Purchase a raffle ticket, and have a chance to win great prizes like a MOM’s grocery store gift card, hand painted rain barrels, golf and fitness passes, performance tickets, and more! · Hands-on activities and crafts for the kids all with a sustainable focus, as well as environmental non-profit groups with educational displays. · Book Exchange — Bring your unwanted books and trade them in for “new” ones! All leftover books will be donated to local libraries in Prince George's county. · Learn about natural dying and create your own indigo dye cloth with the kids. · Purchase art and craft supplies, and make a creative reuse craft with your child at the SCRAP action booth. For information about SCRAP store, programs they offer, or where to donate materials, visit www.scrapdc.org.